While Google Music and iTunes sync have upped the game in terms of cloud music storage, we're quick to forget that Amazon had the first service of its kind out on the market (see our review). In an effort to remain competitive, the online marketplace now announced that you can upgrade your storage to an unlimited amount of MP3s or AACs if you have a 20GB or higher plan. You can then upload as many files as you want to the service, and it won't use up any of your bandwidth. You can find the details of the promotion in this handy FAQ provided by Amazon. What files are eligible for storage in unlimited music space? Files purchased from a digital music store, such as the Amazon MP3 Store, and files imported to your computer from a music CD will often meet these criteria. Files that meet the criteria don't count against your Cloud Drive storage quota if your storage plan includes unlimited music space. 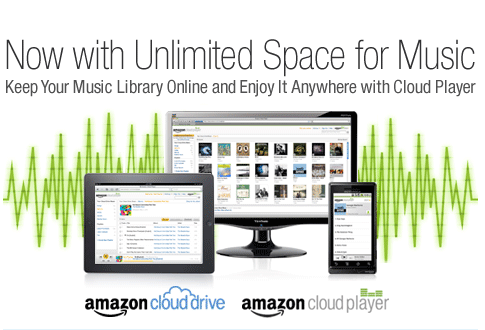 Are files already stored in my Cloud Drive eligible for storage in unlimited music space? Yes. Eligible MP3 (.mp3) and AAC (non-lossless .m4a) audio files already stored in Cloud Drive will automatically be stored in unlimited music space. How do I upload music to unlimited music space? 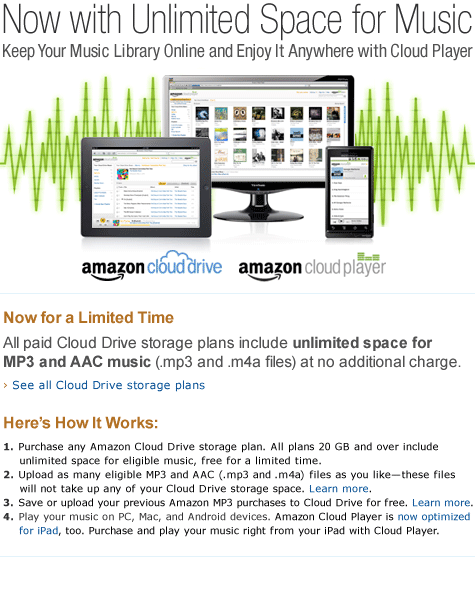 Visit the Amazon MP3 Uploader page for detailed instructions on uploading your music to Cloud Drive. Eligible MP3 (.mp3) and AAC (.m4a, iTunes non-DRM files) audio files will automatically be identified during upload and stored for free in unlimited music space. According to Amazon, this promo is available for "a limited time," so sign up while you can. As before, 20GB plans are still being given out with the purchase of any album from Amazon's music store. This counts towards the promotion, so if there was any discs you were planning to buy, now would be the time to do it!